Following its entry in the Renewable Project of the Year, Wilo UK was awarded with a Highly Commended award at the recent H&V News Awards 2017 held at the Grosvenor House Hotel on Park Lane in London. The entry was for a partnership project with Renewable Heat UK for an anaerobic digestion plant extension at Broom House Farm in Derbyshire. 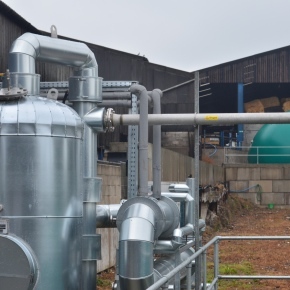 The new anaerobic digestion system enables all organic matter produced on the farm to go directly into the digester. The system draws methane off the top of the system using it to fire an engine generator that generates 250mW of electricity – 10% of which powers all the electricity required by the farm with the other 90% going to the grid – producing enough electricity theoretically, to supply a small village. 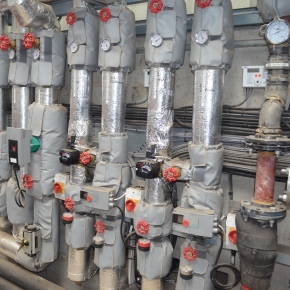 The system directly heats a large header tank to dissipate the heat, and this water is then pumped around the site using the high efficiency Wilo pumps to share the heat across the site, as it has no radiator. The low methane slurry waste product can then be spread on the fields with an 80% reduction in smell. In addition, the fertiliser is activated far more quickly on the fields after digestion. The heat that the system’s engine generates heats the drinking water for the cows to 30 degrees C, resulting in an 8-10% better milk yield and the cow shed is heated to 20 degrees C enabling faster growing, healthier calves on the farm.